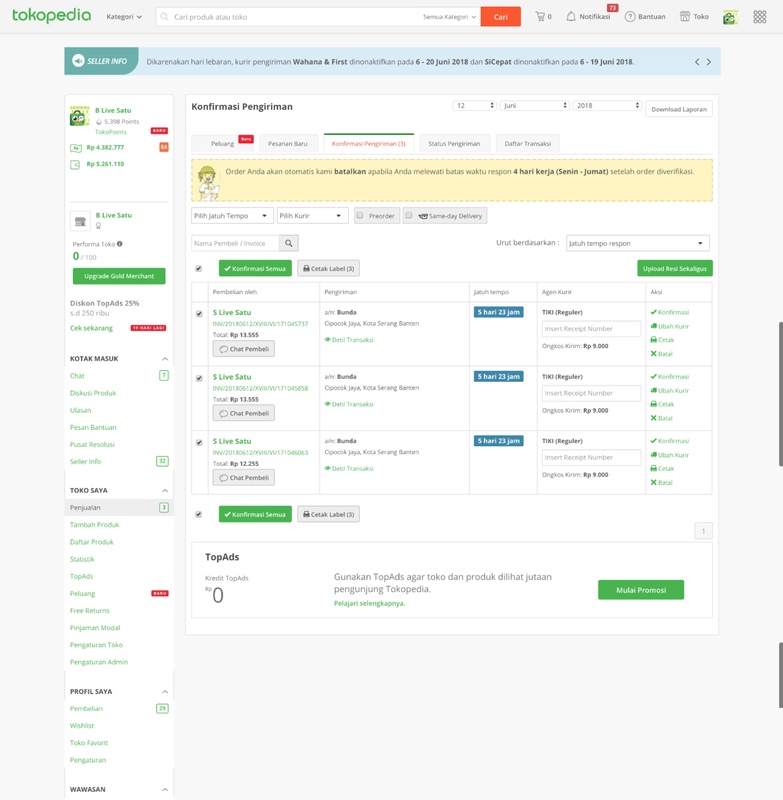 Tokopedia’s seller’s order processing system has been used by millions of merchants across Indonesia for more than 5 years yet never once been revamped – the outdated design is no longer capable in catering to the current or future use cases. Instead of merely revamping the visuals, we created a modular and dynamic template system to safely accommodate the endless additional components in the future without ruining the design. 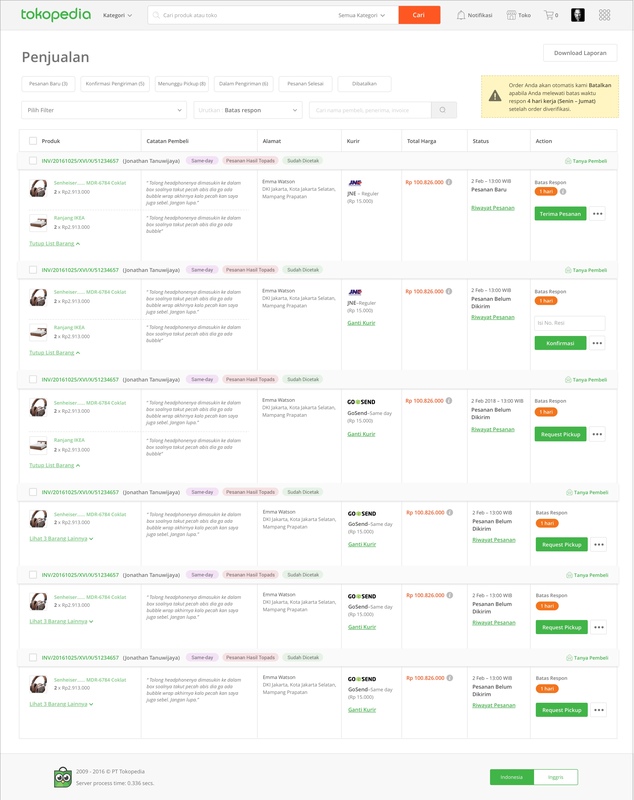 To solve the cluttered layout problem, the design goal is to create a unified and modular order list in a tabular format that could cater to all status and use cases. For this revamp, the measured metrics are happiness (user satisfaction) and adoption (amount of user converting to the latest version). To create a product that aligns with the seller’s context, we conducted multiple seller visits to investigate pain points and observe their behaviour when using the product. Surprisingly, after visiting 7 sellers, aside from logistic-related problems which is out of our control, none of the sellers claimed to have any problem or complain about the product. On the contrary, they were highly satisfied with it and most of them requested us not to radically revamp the product to avoid a steep learning curve. On the contrary, they were highly satisfied with it and most of them requested us not to radically revamp the product to avoid a steep learning curve. Before jumping to the design, we need to understand the product’s dependencies, limitation and use cases to achieve sustainable, viable and consistent design. Still unsatisfied with the result of the seller visit, we tried to spot problems from multiple angles. Consistency is the main issue of the design, therefore we mapped out and synthesised all sorts of findings to spot solution opportunities. 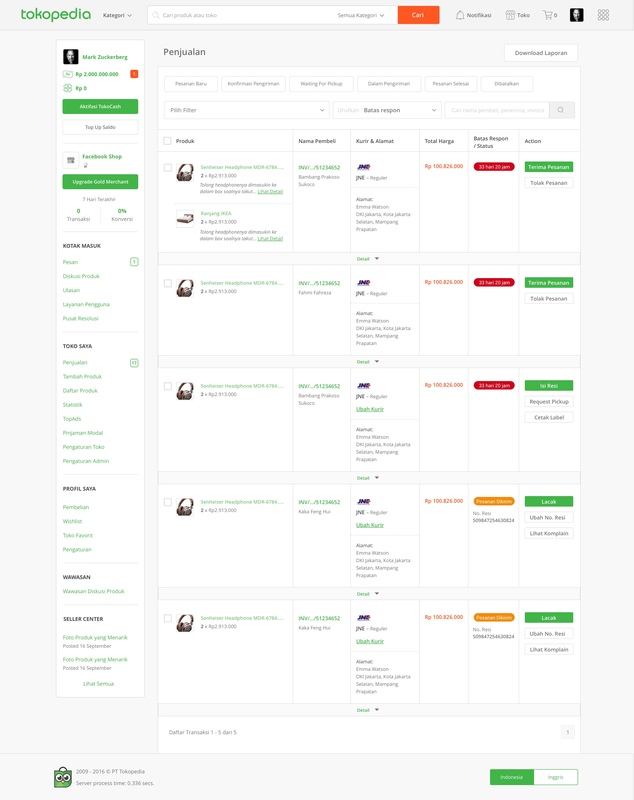 Unfortunately these designs weren’t able to cater to all use cases, so we constantly tweaked the it to achieved a viable layout. 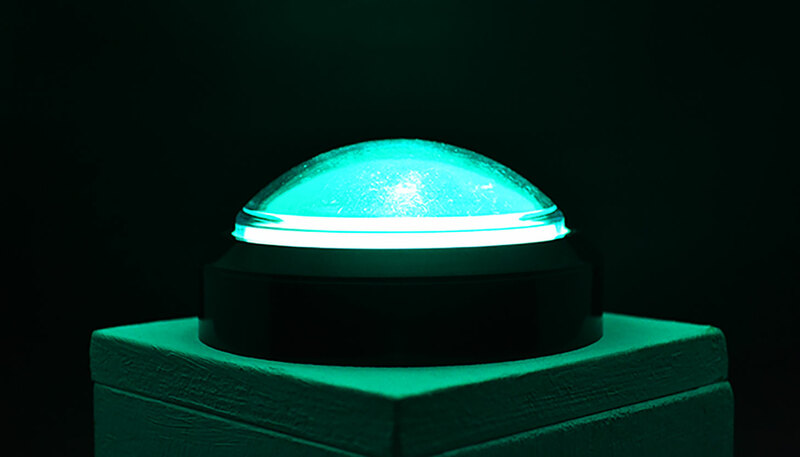 The design was tested to 9 users, among them 3 were big sellers with a minimum of 50 incoming orders a day. The insights were divided into 2 parties – the small-medium sellers were more satisfied with the old design since they are highly accustomed to it and didn’t provide positive remark on the new design. 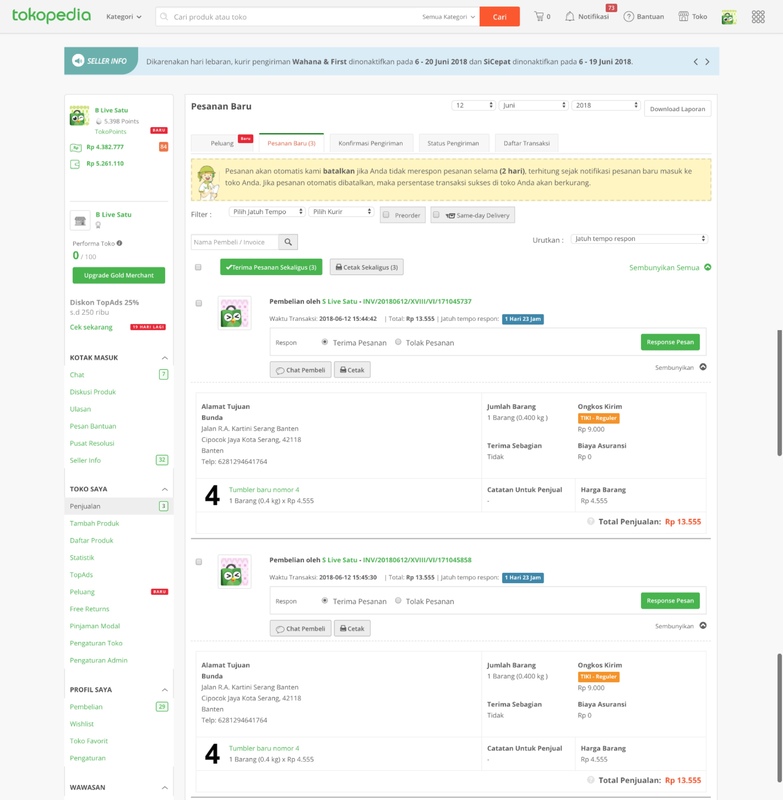 Expose order detail – Better experience in reviewing order detail without clicks. 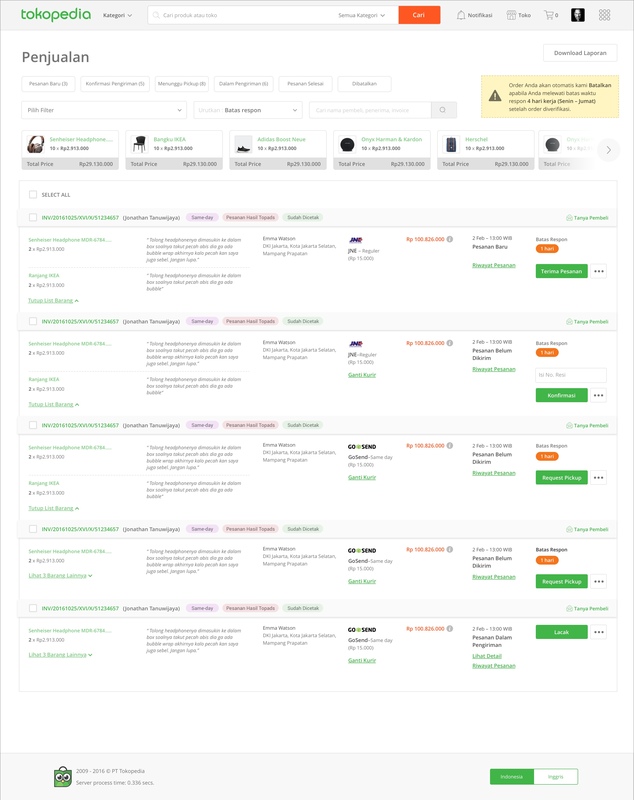 Simplify order acceptance through auto-accept order feature – Every seller we visited claimed to instantly accept every received order without first checking their product stock. So we decided to simplify the experience by automating the order acceptance process. One tab filter – All orders are on the same page, only different states. The illusion of low learning curve – maintain the existing order processing flow and the filters in the one tab concept to provide the illusion of the tabbing system in the old design. Eliminate auto-accept order since sellers were worried about the penalty rules in the existing system. Provide more negative space to avoid cluttered visuals. To avoid inconsistent layout when more elements are added to the design in the future, we made the order list guideline to cater to all 16 different use cases and future use cases. After formulating the template, the design was handed over to UI and proceeded to development. Below is the example of the finished product. Part 8 — And The Result is?